Fixing heavy shelves or objects to plasterboard walls and ceilings can be a disaster if the correct wall plugs or fixings are not used. The picture shows the main types of fixings that we can use, depending on the intended load. 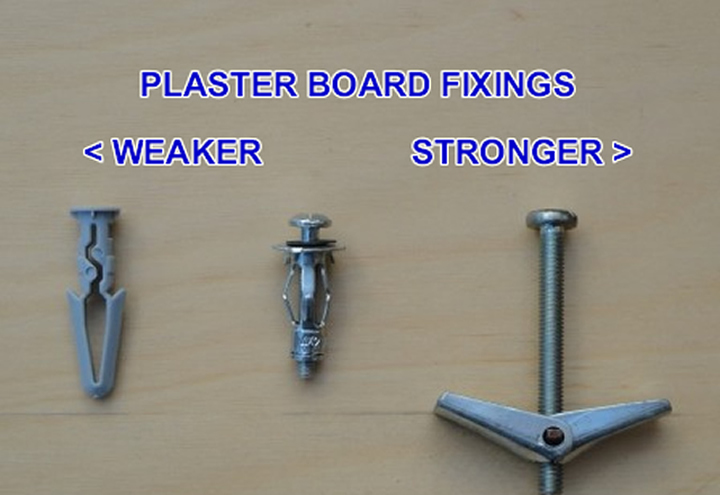 The first one is a plastic wall plug (rawl plug) that opens as the screw enters, these are the weakest plaster board fixing but can work well if used correctly for light to medium loads. The second fixing is a metal Hollow Wall Anchor these expand as you tighten the screw, opening up behind the wall, these ideal for medium to heavy loads, especially if there is a strong pulling effect from the wall. The third fixing is a sprung or Butterfly fixing this spring out once pushed through the wall; this spreads the load over a large area making these the strongest fixing, idea for cupboards and heavy loads. 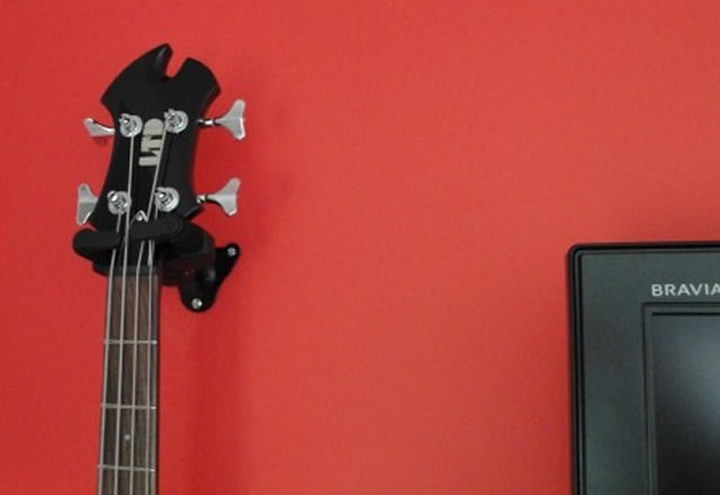 The project we are carrying out is to attach a bracket for an electric guitar. Before we start make sure there are no pipes or cables (don’t drill above or below power sockets etc) in the wall where you want to drill. Plaster board is soft so take your time with a hand or low powered drill, that way should you hit anything it will not be harmed. The guitar is quite heavy so we are going to use a Hollow Wall Anchor fixing, it is very important to drill the correct size hole as marked on the packet, as these types of fixings expand, 8mm in this case. Once drilled gentle tap the fixing into the hole, then tighten the screw fully to expand the fixing, remove screw and refit with bracket.